Croat Group Sues Bob Dylan For Racism In France : The Two-Way At issue are comments the singer made in an interview in which he drew a line between Nazis and Croats. The France-based Croat group calls it "an incitement to hatred." France has strict laws against hate speech. 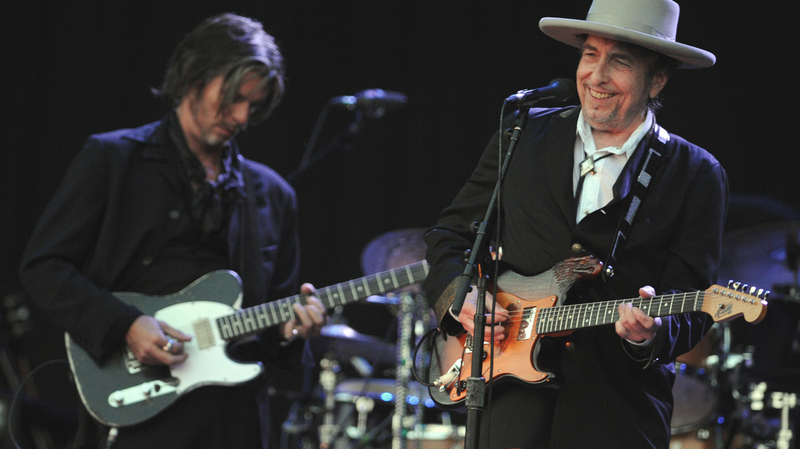 Bob Dylan performs at Vieilles Charrues music festival on July 22, 2012, in Carhaix-Plouguer, France. The singer is being sued by a France-based Croat organization for racism. Think twice — it may not be all right. Bob Dylan is being sued by a France-based Croatian organization for alleged racism following an interview last year in which the music legend loosely compared Croats and Nazis. France has strict laws against hate speech, and the Council of Croats in France says it wants an apology from Dylan. His "comments were an incitement to hatred," Vlatko Maric, the group's secretary said, according to The Guardian. Just last month, Dylan was awarded France's Legion d'Honneur. Dylan's comments came in an interview with Rolling Stone in 2012, when he was asked to comment on present-day America. Dylan said the U.S. was too focused on race. "It's a distraction. People at each other's throats just because they are of a different color. It's the height of insanity, and it will hold any nation back – or any neighborhood back. Or any anything back. Blacks know that some whites didn't want to give up slavery – that if they had their way, they would still be under the yoke, and they can't pretend they don't know that. If you got a slave master or Klan in your blood, blacks can sense that. That stuff lingers to this day. Just like Jews can sense Nazi blood and the Serbs can sense Croatian blood. "It's doubtful that America's ever going to get rid of that stigmatization. It's a country founded on the backs of slaves." The Guardian reported that several Croatian radio stations removed Dylan's songs from their playlists following the interview. "We have nothing against Rolling Stone magazine or Bob Dylan as a singer," Maric said, according to The Guardian. "[But] you cannot equate Croatian [war] criminals with all Croats." No word yet from Dylan.